Apologies to anyone who might still be clicking on this site for updates. I’ve struggled to find the inspiration for most of the season, but hope to restore a regular service shortly. 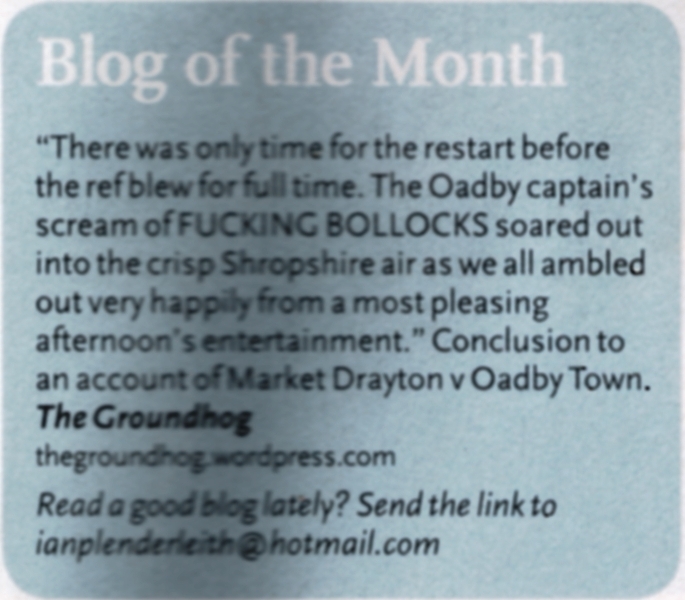 I scoured the non-league fixtures looking for one more fix of football for the season – the Evostik, the NWCL, EML, WMRL, Midland League etc etc, then all the local county leagues…but could find nothing. A lack of postponements earlier in the season had brought most leagues to a scheduled stop, rather than the more usual dribbling on until mid to late May. Just as I was resigned to a few months off, this game appeared in the Liverpool League, just about the only county league within a sensible distance that I hadn’t checked. Not just an extra game either; it turns out it was the closest finish to the league you could imagine. Closer than Liverpool-Arsenal 1989 (good ball by Smith…finding Thomas…). The Liverpool Senior League was a three team race until the previous Saturday. On that Saturday Waterloo Dock were at home to East Villa. East Villa needed to win by 2 clear goals and hope that Aigburth lost to Waterloo by not more than two goals the following Friday. In an entertaining game Villa were indeed 2 goals up (4-2) until the last 15 minutes when Dock got a goal back. This led to the bizarre position of East Villa going top with their last game but being mathematically certain not to win the league. With Waterloo on the same goal difference as East Villa, a win for them would clinch them the title, whereas had they lost 4-2 last week, a one or two goal win would not be enough, due to goals scored. Aigburth needed just a point to clinch the title. So this set up a Friday night league championship decider at Aigburth’s Cheshire Lines Recreation Ground that was unmissable. 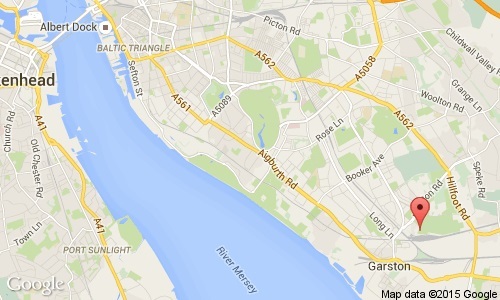 Both sides have long histories and are well known names in the Liverpool area. 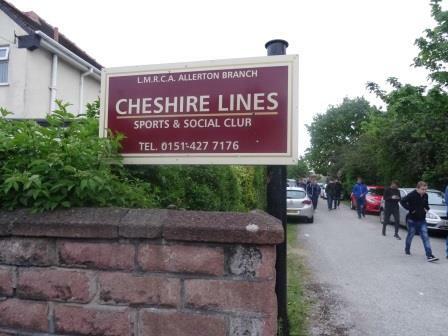 Reigning champions Aigburth’s Cheshire Lines Ground is a stone’s throw from the now defunct non league club South Liverpool’s Holly Park. Holly Park is now South Liverpool Parkway Rail Station. 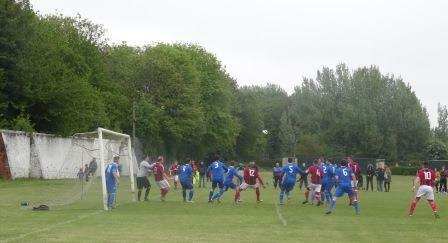 (the new South Liverpool play up the road at Otterspool Park, in the West Cheshire League). I was expecting a higher than average crowd for a county game but nothing like what I saw. Arriving bang on kick-off thanks to ridiculous and unaccountable heavy traffic on the M6 and M56 (why???? people rushing to Runcorn for the bank holiday weekend?) I had to park badly in Southmead Road, almost blocking a drive. A huge crowd was already stood behind the rail and rope that skirted 3 sides of the pitch. Fans were at least one deep all round; another hopper’s headcount was 663. The match was intense, as might have been expected. Chances were at a premium, as was space on the ball. After about 30 mins though, Dock made a breakthrough with a through ball to Alex Strannock who calmly rounded the keeper and fired in – Dock were top and champions elect. It was now their’s to lose. In the second half APH were much better and enjoyed more possession. Their pressure finally paid off about 10 minutes from time, when a long throw in bobbled about in the area before Kurt Sherlock fired holme from close range. An elementary tap in to send the home contingent berserk. The title was back in their hands. For the last 10 minutes Dock had few chances to steal it back and come the final stages it was Sherlock again who ensured celebrations were now afoot for Aigburth, with a deft 20 yard chip over the keeper. The Cheshire Lines Ground became a valley of fear for Waterloo, as they realised it was over. On balance APH deserved it on the night and retain the Liverpool County League. What an advert for grass roots football. This entry was posted in Travelog and tagged Aigburth People's Hall, Liverpool County Senior League, Non-League, Waterloo Dock. Bookmark the permalink.